Journalists at Daily Mail Australia website have been condemned as “vultures who feast exclusively on the hard work of real journalists” amid a new copyright infringement claim. The comments were made by the editor of Australian newspaper The Daily Telegraph who has accused the website of plagiarising a story. A legal letter has also been sent demanding its removal, an apology and damages. Meanwhile, Daily Mail Australia has hit back (below) with a series of examples in which it claims its stories have been taken without attribution by rival Australian titles. 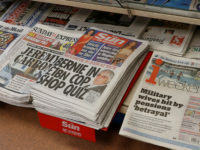 Last year News Corp Australia, publisher of The Australian and The Daily Telegraph, reached a legal settlement with Daily Mail Australia after complaining about widespread lifting of stories. 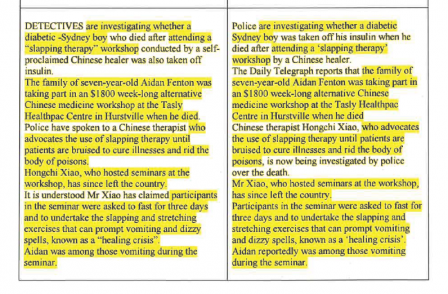 The latest row follows publication of a front-page story in The Daily Telegraph which revealed that a seven-year-old diabetic boy had died after visiting an alternative health workshop which included ‘slapping therapy’. The original piece appeared on The Daily Telegraph website at midnight on Friday and the Daily Mail Australia version appeared around two hours later. The above illustration (credit: The Australian) highlights apparent similarities between the first six sentences of the two articles (the original Daily Telegraph story is on the left, and the Daily Mail Australia story is on the right). The Daily Mail Australia story credits The Daily Telegraph in the second sentence. But The Daily Telegraph believes the many similarities between the two articles mean Daily Mail Australia has still breached its copyright. 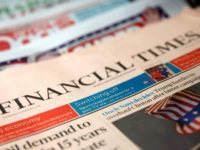 A Daily Mail Australia spokesperson said in a statement: "At Daily Mail Australia we are committed to telling the stories of the day that matter to Australians – this includes breaking news, original reporting and following up on the important stories of the day (in online publishing this is known as aggregation). "The story which is the subject of the Daily Telegraph’s complaint was followed up by most other news websites. In line with online news best practice, Daily Mail Australia provided two hyperlinks to the Daily Telegraph’s story. However in good faith we have made subsequent edits to the story while our legal advisers review the complaint. "Regrettably, News Corp’s Daily Telegraph website and news.com.au continuously fail to link and source material back to Daily Mail Australia. "On April 22, 2015, news.com.au journalist Alison Stephenson’s story on Geordie Shore star Gary Beadle, mirrored an original story by Daily Mail Australia, yet there was no hyperlink provided to the original source. "On March 4, Daily Mail Australia obtained exclusive photographs of condemned Bali Nine smugglers Myuran Sukumaran and Andrew Chan on the tarmac at Cilacap, Indonesia. "These photographs (at the top of the story, beneath the video module) were published exclusively by Daily Mail Australia and less than an hour later were stolen by the Daily Telegraph website, news.com.au and The Australian’s website. The pictures were credited as ‘supplied’, which Daily Mail Australia views as a transparent attempt to disguise the theft. "It is troubling that News Corp continues to cry theft when their stories are followed up with proper attribution by Daily Mail Australia. It’s time that their journalists and editors provide proper attribution and hyperlink to the original source when they are lifting stories from their more successful competitors."